LGR's Hydrogen Chloride Analyzer (HCl, H2O) provides sensitive measurements of HCl and H2O in ambient air or in industrial process flows (e.g., coal and cement exhaust streams) continuously with extremely high precision and sensitivity. No longer do you have to spend a lot of money or wait a long time to measure HCl with extremely high sensitivity – LGR's HCl Analyzer provides measurements every second with sub-ppb-level precision. In addition, the Analyzer can report measurements quickly over a very wide range of HCl concentrations (for process control and compliance monitoring applications). The instrument, based on LGR's cavity enhanced laser absorption spectroscopy, is extremely simple to use, inexpensive to operate, and includes all components (internal vacuum pump, keyboard, mouse, video monitor) to start recording data within minutes. Other atmospheric gases, including water vapor, carbon dioxide, oxygen, and methane, do not interfere with the HCl measurements. The instrument includes an internal computer that can store data practically indefinitely on its internal hard drive (for unattended long-term operation), and that can send real-time data to a data logger through its analog and digital (RS232) outputs. In addition, an Ethernet connection allows remote access to data files stored on the instrument’s hard drive. LGR's HCl Analyzer provides the high quality data necessary for the most demanding trace gas monitoring applications. LGR’s HCl Analyzer is available in different packaging options to allow users to select the one most suitable for their needs. LGR’s standard rackmount package fits in a standard instrumentation rack and requires only 80 W to operate, an external keyboard, mouse, and video monitor. For highest performance, the Hydrogen Chloride Analyzer is now available in LGR’s new “Enhanced Performance” or EP package. The EP version incorporates proprietary internal thermal control for ultra-stable measurements with unsurpassed precision, accuracy and drift. For users wishing maximum portability, LGR’s new “Ultraportable” series provides unparalleled ease of transport for users to carry the instrument anywhere. For simultaneous measurements of HCl and HF, please see LGR's new HCl/HF Analyzer (also available in the new Ultraportable package). The analyzer uses LGR’s patented Off-axis ICOS technology, the fourth-generation cavity enhanced absorption technique, which employs a high-finesse optical cavity as the measurement cell. LGR’s technology has many proven advantages over conventional first-generation cavity ringdown spectroscopy (CRDS) techniques. In brief, since the laser beam does not have to be resonantly coupled to the measurement cell (i.e. precise beam alignment is not critical), LGR Analyzers are relatively inexpensive, simple to build, and inherently robust thermally and mechanically. In addition, since LGR’s technology can record reliable absorption spectra over a far wider range of optical depths (absorbance values) compared with conventional CRDS, LGR Analyzers provide measurements over a much wider range of mole fractions (gas concentrations). 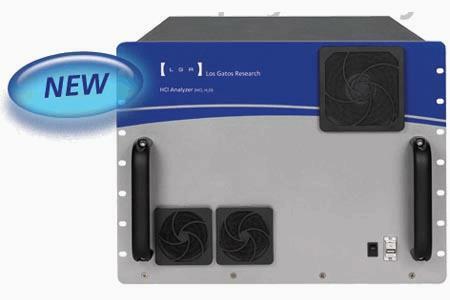 Finally, due to the ease and simplicity of recording and quantifying the measured spectra using LGR’s Off-Axis ICOS, LGR Analyzers display the entire absorption spectra to the user in real time allowing for immediate system diagnostics and performance validation. The Analyzer has an internal computer (Linux OS) that can store data practically indefinitely on its hard disk drive and send real time data to a data logger via the digital (RS232) or Ethernet outputs. Furthermore, as with all LGR analyzers, this Analyzer may be controlled remotely via the Internet. This capability allows the user to operate the analyzer using a web browser anywhere.